As The Guardian and others have described the dispute, the shareholders of the paper want to turn the heritage building that houses Libération into a kind of cultural and social space to hold events, and they want the staff to focus on building up their presence on social-media platforms as well as moving more quickly into areas like mobile. And presumably some or all of these decisions are motivated by a desire to monetize the paper’s content better, in order to keep it in business. Not surprisingly, perhaps, the reporters and editors at the paper are not happy about this move, which comes on the heels of earlier plans to cut more than 50 jobs. 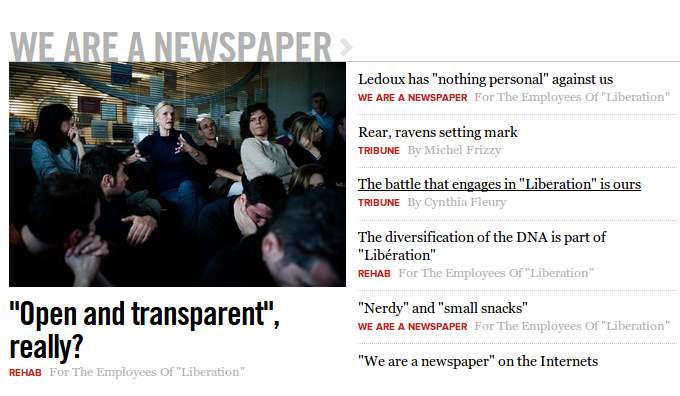 And no doubt at least some of the passion that they have expressed about their journalism has to do with the Libération‘s history as a plucky left-wing upstart in the French media industry — one whose editorial meetings used to be conducted by having all of the available staff vote on which stories to pursue. At the same time, however, their resistance to the moves proposed by shareholders could ultimately do more damage than the proposals they are resisting. The success of those proposals isn’t assured, by any means, but refusing to even attempt to change in those ways is likely to ensure Libération‘s doom much more quickly than a failed social or cultural event strategy. Sartre co-founded Libération in 1973 in the wake of the social protest movements of the late 1960s, and he was its first editor. The first edition of the paper had just four pages. It eschewed advertising for years, but eventually it fell on hard times and a group of shareholders including Édouard de Rothschild of the European banking family had to step in and save it in 2005. Like almost every other newspaper in the Western world, Libération has been struggling to maintain its former glory, with revenue from advertising (which the paper started accepting in 1982) declining rapidly and digital not making up the difference. So the shareholders have apparently decided they need to make some radical changes, and their focus is on using the brand name of the paper to connect with a broader market of potential readers and supporters. In my opinion, this is exactly what the newspaper needs to do — and what other papers need to think about doing as well, if they aren’t already. If your newspaper or media outlet isn’t somehow connecting with a community of passionate fans and supporters, as De Correspondent in Holland is doing, whether it’s through real-world events like conferences or through social media, you will almost certainly fail, as Josh Stearns of Free Press has also pointed out. It’s somewhat odd that the staff of Libération wouldn’t recognize this, since Sartre’s “brand” (if you will) and connection to a passionate group of believers is what brought the paper into being in the first place, thanks in part to the social and cultural hub known as the Cafe Flore on Boulevard Saint-Germain where Sartre and his fellow philosophers held court. And the lack of that kind of social and community support will almost certainly take it out again.